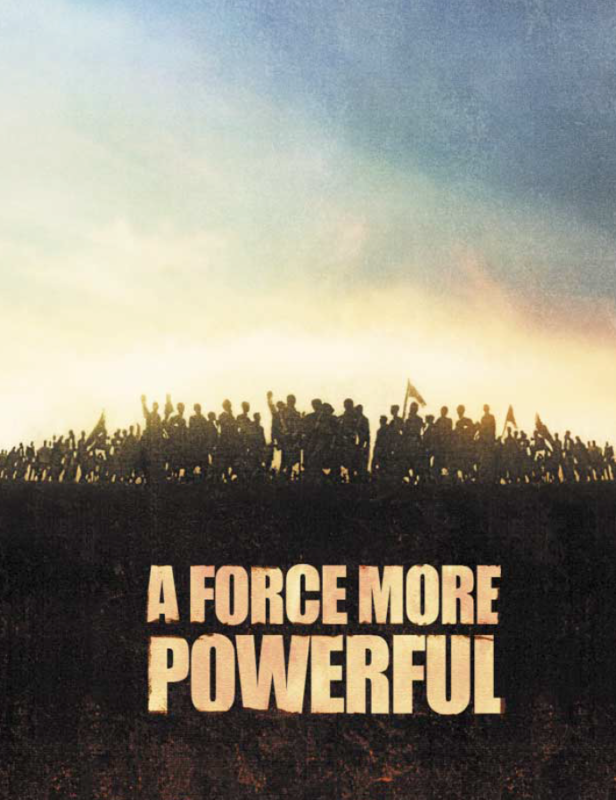 A Force More Powerful explores how popular movements battled entrenched regimes and military forces with weapons very different from guns and bullets. Strikes, boycotts, and other actions were used as aggressive measures to battle opponents and win concessions. Petitions, parades, walkouts and demonstrations roused public support for the resisters. Forms of non-cooperation including civil disobedience helped subvert the operations of government, and direct intervention in the form of sit-ins, nonviolent sabotage, and blockades have frustrated many rulers’ efforts to suppress people. The historical results were massive: tyrants toppled, governments overthrown, occupying armies impeded, and political systems that withheld human rights shattered. Entire societies were transformed, suddenly or gradually, by nonviolent resistance that destroyed opponents’ ability to control events. These events and the ideas underlying nonviolent action are the focus of this three-hour documentary production. The series begins in 1907 with a young Mohandas Gandhi, the most influential leader in the history of nonviolent resistance, as he rouses his fellow Indians living in South Africa to a nonviolent struggle against racial oppression. The series recounts Gandhi’s civil disobedience campaign against the British in India; the sit-ins and boycotts that desegregated downtown Nashville, Tennessee; the nonviolent campaign against apartheid in South Africa; Danish resistance to the Nazis in World War II; the rise of Solidarity in Poland; and the momentous victory for democracy in Chile. A Force More Powerful also introduces several extraordinary, but largely unknown individuals who drove these great events forward. Few who relied on nonviolent sanctions in the 20th century did so because of a principled attachment to nonviolence. For some, arms were unavailable as a way to fight. Others had seen a violent insurrection fail, at devastating cost to life and property. They had no desire to be passive: they wanted passionately to overturn the rulers or the laws that subjected them, and they found a way. The greatest misconception about conflict is that violence is the ultimate form of power, surpassing other methods of advancing a just cause or defeating injustice. But in conflict after conflict throughout the 20th century, people have proven otherwise. At a time when violence is still too often used by those who seek power, A Force More Powerful dramatizes how ordinary people throughout the world, working against all kinds of opponents, have taken up nonviolent weapons and prevailed.